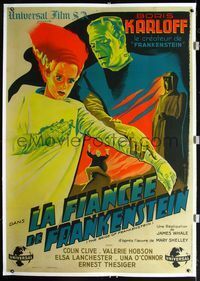 2p038 BRIDE OF FRANKENSTEIN linen French 1p R46 cool Belinsky art of Lanchester & Karloff in makeup! Condition: very good to fine. The poster had tiny paper loss at some crossfolds and minor fold and border wear. Overall, the poster was in very good to fine condition prior to linenbacking. The poster was well backed, and looks great!